Susann Krzyminski, 22, was on hand at Fenway Park May 22 for her first Red Sox game, an interleague matchup with the Atlanta Braves. She paid $45 for her ticket in Section 23, Row 2, Seat 17, and sat just down the third base line . . .
Smack dab behind a pole. She couldn't see the pitcher, the batter, or the entire right side of the field. And still she was gushing. ''I wanted to go since I was a little girl," said Krzyminski, a manager of a doughnut shop in Framingham who paid full price for her obstructed-view seat, but still doesn't believe the Sox are being greedy. ''I don't really care. It's just fun to be here. No matter what, this is great . . . I can see the [Jumbotron] screen." Before the 2004 season, obstructed-view seats -- defined by the Red Sox as being blocked from seeing both the hitter and the catcher -- were discounted by a third. That is not the case this season. But with the Red Sox being the reigning World Series champions for the first time in 86 years, nobody's really complaining. According to the team, complaints are down 70 percent from last year. Surely, there must be an outcry from the people sitting behind poles, or in those weird right-field seats that face the bleachers. There must be unhappy souls sitting behind the Jumbotron in the far reaches of the center-field bleachers. But when you take a tour of Fenway, Krzyminski's attitude is the rule rather than the exception. An unscientific sampling of fans in some of Fenway's quirkiest seats found Red Sox Nation basking in serenity. The team is on pace to break the all-time attendance record (2.8 million) set last season and has a season-ticket waiting list of 3,000 hopefuls. Fans who complained last year about paying $4.25 for a bottle of water are now allowed to bring a bottle to the park -- proof, the Sox say, that management is listening. Ticket complaints are down 60 percent from last year, according to Sox officials. ''Now it's availability of tickets that's the chief complaint," said Sarah McKenna, director of fan and neighborhood services. ''I don't believe I've gotten any [complaints about obstructed seats being full fare]. I don't remember any this year yet," said Richard Beaton, Red Sox director of ticket operations. He says the team would issue refunds, even though warnings about the seat being obstructed are given repeatedly in the online buying process. But why pay full price to sit behind a pole? Even Red Sox vice president of public affairs Dr. Charles Steinberg, a marketing genius, said with a shrug, ''You got me. I know that when we got here, we were amazed and amused at some of the quirky seats we've got here. Seats squarely behind poles. Seats that had been installed before we got here in a cross aisle where fans have to shimmy on through with a lot of excuse me's. I think it's clear that the work of these annual Fenway improvements is far from done. The main focus of our improvements has been more seats, more space, more information. So the new seats that you build [such as those above the Green Monster] are the roomy alternative to the odd ones and the cramped ones." Steinberg says Fenway is unique, warts and all. ''Sometimes you're going to find somebody loves being here so much it's not about the seat, it's about the atmosphere," he said. ''There's a remarkable spirit among the members of Red Sox Nation that is attracting them to the ballpark regardless of the quality of the seat because in a phenomenon you just want to be there. You want to be where the nation is uniting." Red Sox fans pay the highest ticket prices in baseball, and the increases have made attending a game prohibitively expensive for a working-class family of four. Club officials say it is because of the intimate size of Fenway and a $121.3 million payroll, second only to the Yankees. Ticket brokers say Red Sox tickets are the most coveted in baseball. ''I definitely sell more Red Sox tickets than any other team and that says a lot because I'm in San Francisco," said Zach Winter, a sales rep for StubHub tickets, an online service. And the faithful are happy, even those farthest away from the action. Nicholas Harght, 26, a landscaper from Marshfield, is seated behind the Jumbotron in the center-field bleachers in Section 38, Row 40, Seat 4. ''The scoreboard's overrated," he said with a laugh. ''You just need to see the field." The Red Sox estimate his seat is roughly 600 feet from home plate. ''I can reach up and touch the moon," he said. ''I'd say it's dead even [distance] between the Citgo sign and home plate. You can't complain." Harght can see the playing field but not the second level of Fenway Park -- it's blocked by the back of the Jumbotron. Harght thinks this frames the field in an artsy way. ''It's like if you had a wide-screen panoramic TV," he said. ''And for $12 it's a good deal, excellent view." Some of the worst and quirkiest seats in the ballpark are located in right field. Many of them face the Wall instead of home plate. But one box seat in the first row beyond the Pesky Pole actually faces the center-field bleachers. ''We should advertise it as the 'Chiropractor's Special,' " said usher Tom Edwards. Carmen Roberts has to turn 100 degrees to the left to see home plate from Section 92, Row B, Seat 1, but she loves it. ''It's the best seat," said Roberts, a season ticket-holder. ''It's your own row and I have a little bit of space. My grandfather is 84 and he doesn't have to get up every moment. It needs a swivel. I've asked them many times and they've said no." When Seattle comes to town, Japanese fans flock to her seat to take pictures. ''I've met everybody from Japan," she said. Courtney Keegan, a market manager for an electrical engineering firm, sits in Section 6, Row 2, Seat 1. It's an obstructed-view $27 seat in the right-field grandstand. Not only does a pole block her view of the batter, but fans are constantly moving in the aisles, further obstructing her sight lines. Keegan almost complains. ''It would be nice if they were discounted," she said. ''They are more expensive than sitting in the bleachers. These are the worst seats I've had ever." Told she could get a refund, Keegan refuses. ''I wouldn't leave to get my money back," she said. 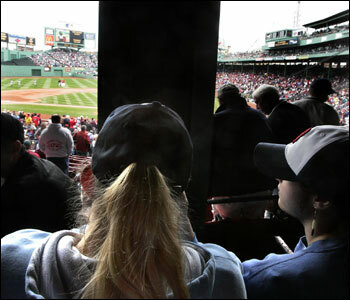 ''Honestly, even with the obstructed view, it's worth it to see a Sox game. In a business sense, they're thinking it's worth it no matter where you're sitting, 'cause Fenway is small. Going to Fenway is an event because it's a small stadium, so not everyone can go. Not like every game in other cities, where it's $14 and not sold out. It's not ideal, but it's still entertaining. It's definitely worth it to see the Sox play. I'm having a great time regardless of the view." Mike Robie of Williamstown, Vt., is sitting in Section 8, Box 94, Row E, Seat 4, and has the Pesky Pole in right field extending over his legs. ''If I jump up I could hurt myself," he said. The $40 ticket was given to him by a friend. ''Other than looking around the pole, it's pretty good," he said. ''You're in the front row. You do have to turn your body to see home plate. It's easy to spot yourself on TV and I got to yell to Trot [Nixon] on that fly ball. I yelled, 'You got room.' Trot made a good catch, then gave the ball to a kid." His wife, Michele, said their first date was at a Red Sox game. ''We met 15 years ago and went to a Red Sox game in Baltimore," she said. ''They won that game and Mike made sure I didn't fall down the steep deck at Memorial Stadium. This is our 13th anniversary and just seeing Trot's face coming right here was worth it." Brad Bouchard, 23, said he bought a Green Monster standing-room ticket on the Sons of Sam Horn website. But the only spot he could find was near a light stanchion in Green Monster Section 10 in left-center field. ''I kind of lose third base, but it's not too bad," Bouchard said. ''I've never been up here and for $20 you can't go wrong. I'm 8 feet from the beer and there's no line. It's great." The improvements the Sox owners have made -- wider concourses, the closing of Yawkey Way for fans, added restrooms -- are all hits with fans. Green Monster seats and the right-field picnic-style seats were gobbled up in mere minutes when they went on sale. Newer premium seats will continue to be added, bringing the ballpark capacity close to 40,000. Fans who expressed their dismay with the .406 club behind home plate were told the glass will be gone by next season, replaced by two-leveled premium seats. But the Sox still don't know what to do with their ancient grandstand. ''The area we haven't tackled to date are these old funny, quirky seats that some people aspire to sit in and other people say, 'Wait a minute, what's the deal here?' " said Steinberg. ''The main complaint with the old wooden seats is that they're less comfortable for people with good size and it's a matter of debate and study and wonder as to what will be the ultimate disposition. So far what seems most manageable is to cease the escalation of that ticket price." Complain about being too big for the grandstand seats and the Sox have a special seat for you. Section 28, Row 3, Seat 1 is its own row. It is designated for someone who is, according to the Sox, ''pleasantly plump." A single seat surrounded by two aisles. An oasis in a sea of fans, recognizable to each other by the marks on their kneecaps from the seat in front of them. On a recent evening, Casey Fontaine, 24, of Manchester, N.H., sat there. ''Is this bad that I'm sitting in a seat for fat people?" he wonders. At 5 feet 7 inches and 180 pounds he's not fat, just lucky. His father gave him the ticket for his birthday. ''It's pretty cool; I like it," Fontaine said. ''Nobody's sitting next to me to bother me. " With a one-third wider seat, Fontaine is not counting calories or cholesterol. ''I've already had a sausage and I plan on getting two more hot dogs and at least three more pretzels," he said. ''Oh, and a bag of peanuts. I always feel like eating, so I don't know if it's the seat or me." One things seems certain -- the world champions aren't likely to lower ticket prices anytime soon. Not even for an intimate evening with a pole. The day after her first Red Sox game, Krzyminski was reached at Honey Dew Donuts. She was still ecstatic, although she reluctantly acknowledged the seat should be discounted. ''It was great," she said. ''They won, we were right there. The best part was watching the home run." But she couldn't really see Manny Ramirez smash his home run, could she? ''I saw where it went," she said. ''Right over the Green Monster." For the record, Ramirez's home run landed in the visitors' bullpen in right field. But that didn't matter. Krzyminski was in the house. © Copyright 2006 Globe Newspaper Company. Have you sat in any of them?